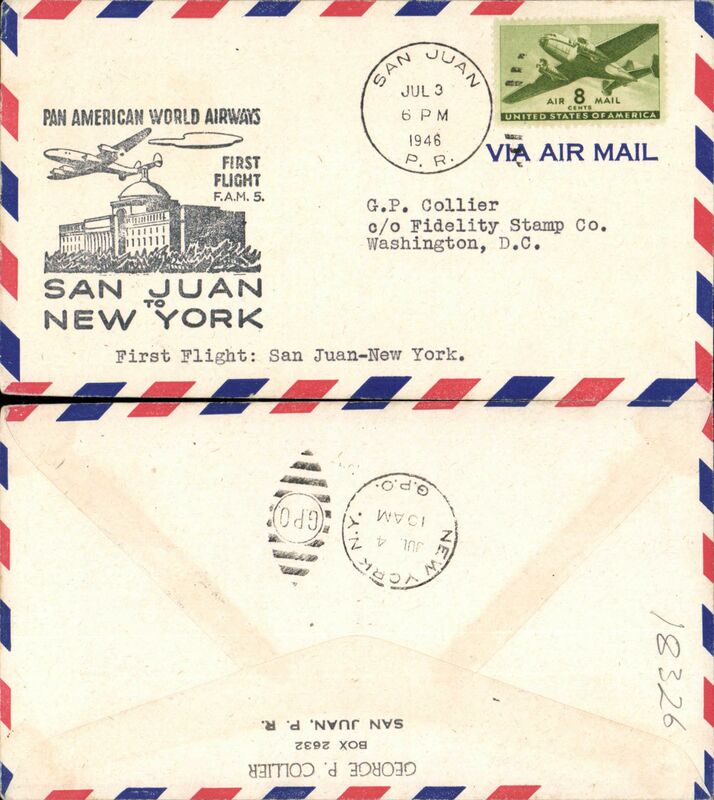 F/F FAM 6, San Juan to Santo Domingo, bs, large red cachet, printed Soto corner cover, Pan Am. 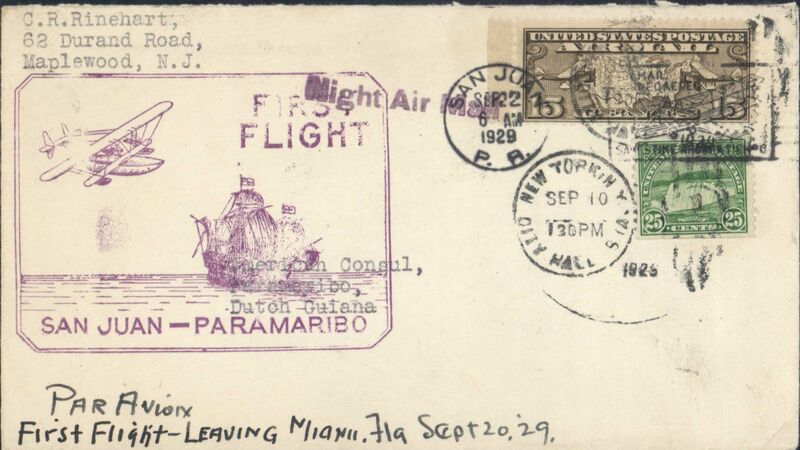 Pan Am F/F FAM 6, San Juan to Miami, bs 10/10, large magenta flight cachet, airmail cover. 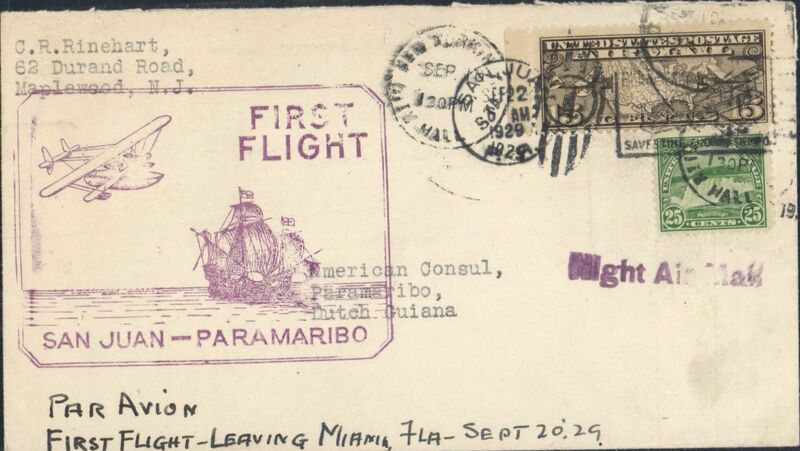 F/F FAM 6, San Juan-Paramibo, Dutch Guiana, bs 23/9, large violet framed flight cachet, plain cover. 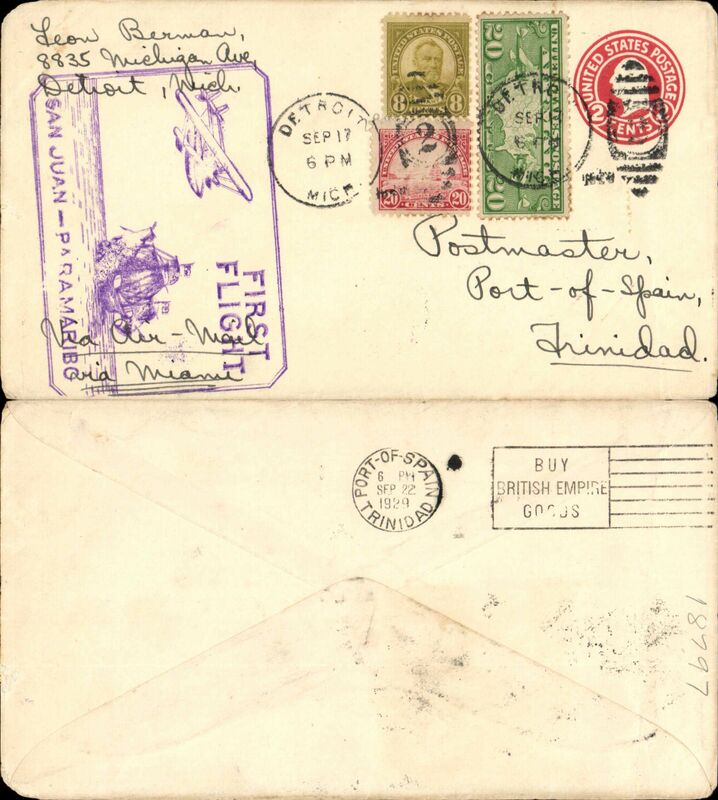 F/F FAM 6, San Juan-Georgetown, British Guiana, bs 23/9, large violet framed flight cachet, plain cover. 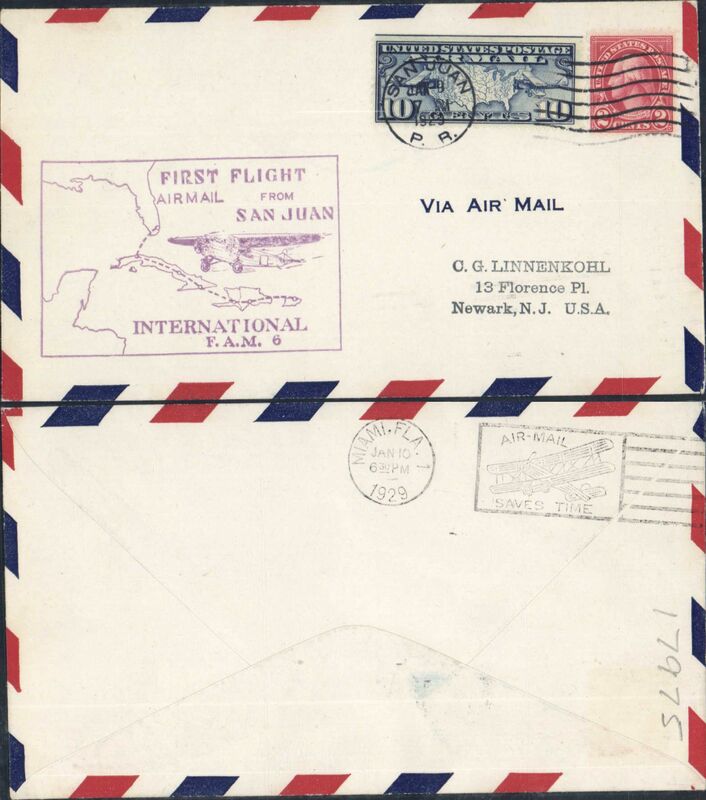 F/F FAM 6, San Juan-Port of Spain, b/s, flown by Lindburgh, Pan Am. Carried by Sikorsky S-38A amphibian. 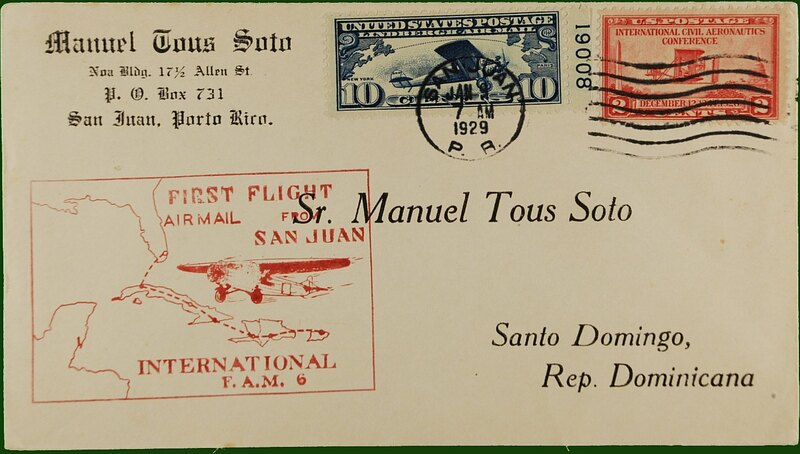 F/F FAM 6, San Juan-St Thomas, b/s, flown by Lindburgh, Pan Am. Carried by Sikorsky S-38A amphibian. 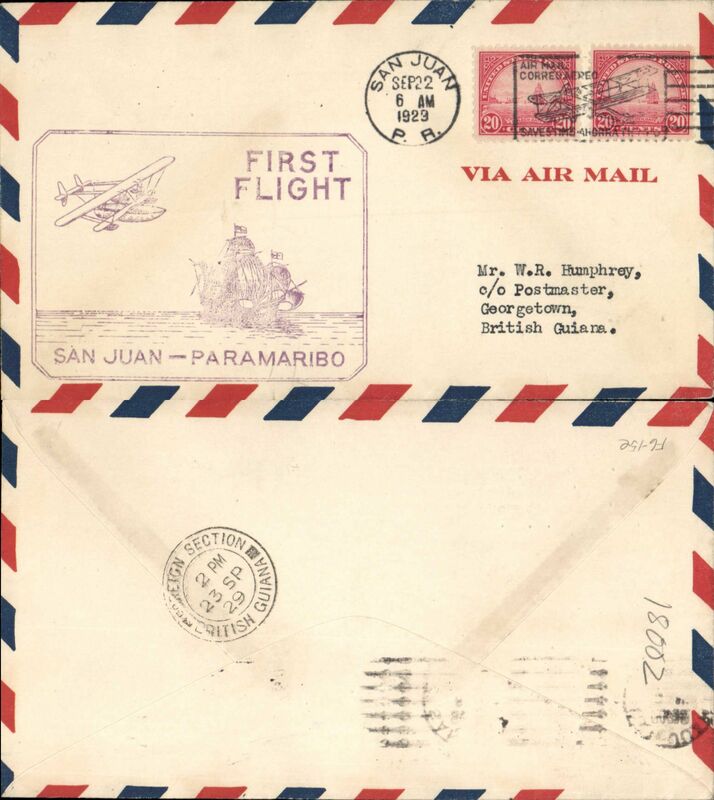 Pan Am F/F FAM 6, San Juan-St Thomas, b/s 22/9, large violet flight cachet 'San Juan-Paramibo', flown by Lindburgh. Carried by Sikorsky S-38A amphibian. 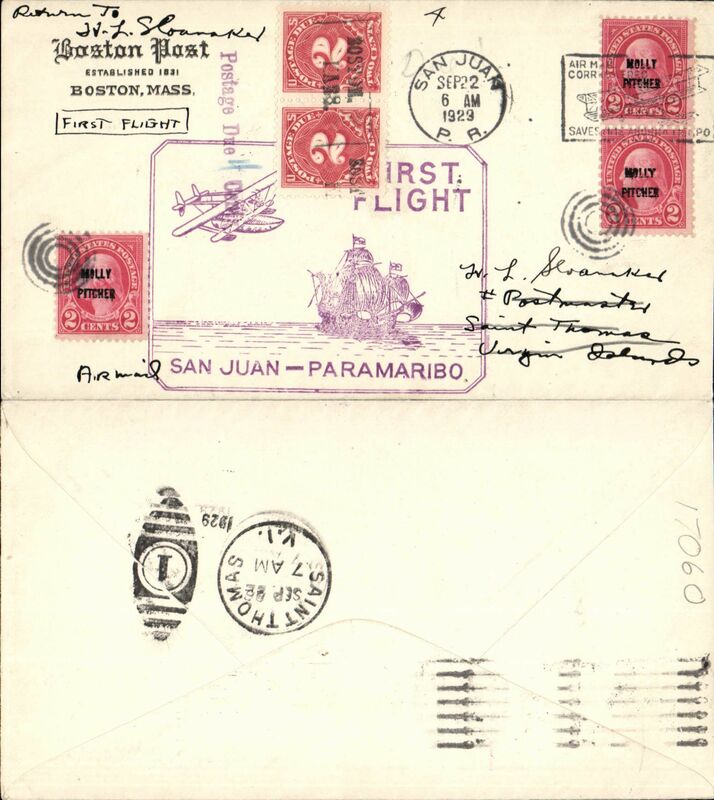 Pan Am F/F FAM 6, San Juan-St Thomas, bs 22/9, flown by Lindburgh in Sikorsky S-38A amphibian. 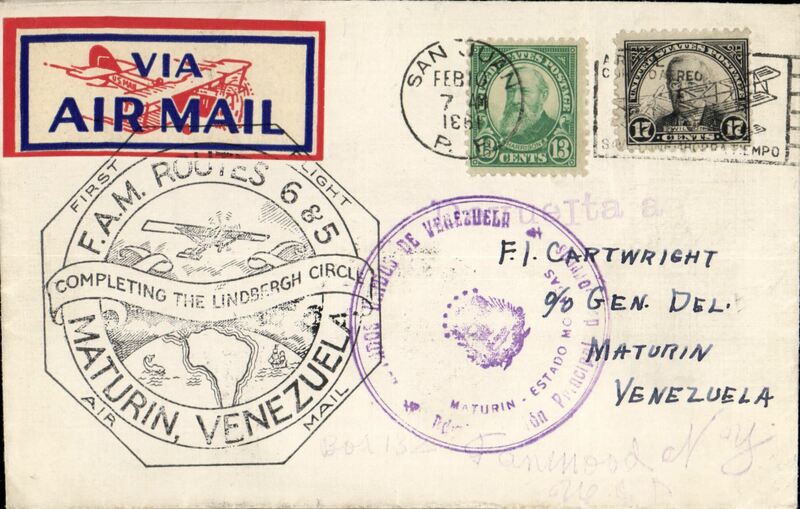 Completing the Lindbergh Circle, first clockwise dispatch on the Lindbergh circle, San Juan to Maturin. 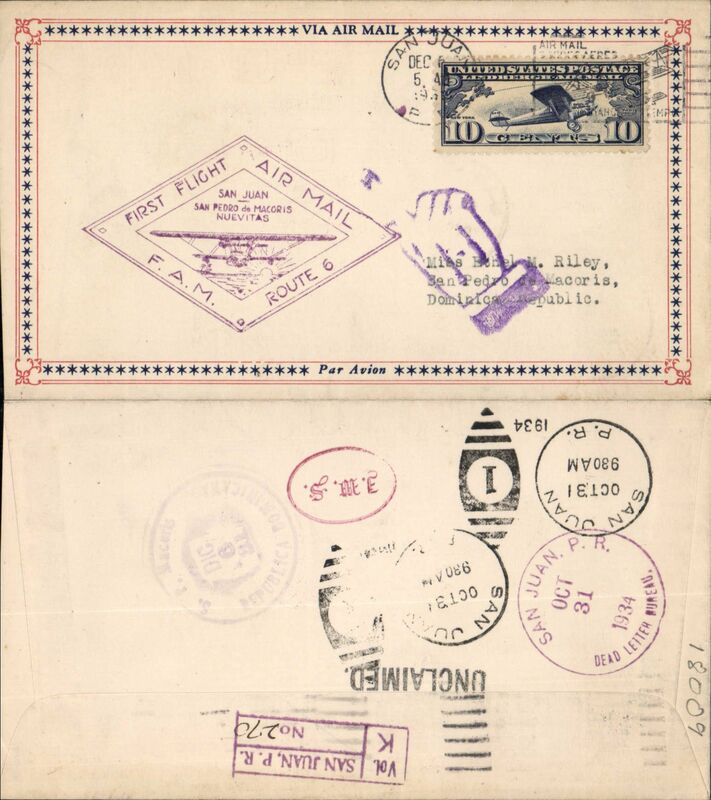 large violet Maturin receiver cachet, black octagonal 'Completing the Lindbergh Circle' type F6P flight cachet. Only 17 flown. 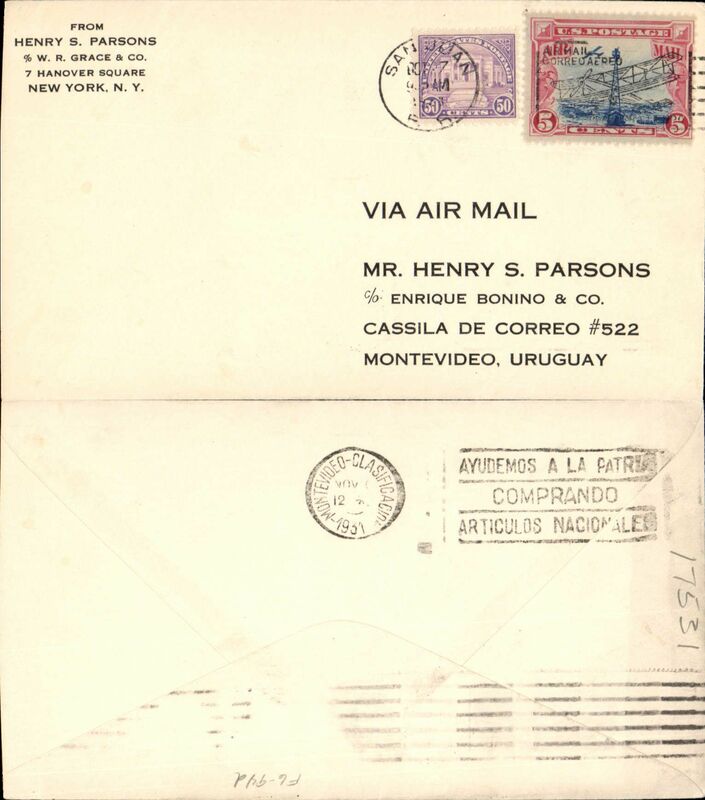 Pan Am FAM6 F/F San Juan to Montevideo, bs 1/11, Henry Parsons corner cover franked 50c & 5c air, canc San Juan cds, no cachet on this leg. 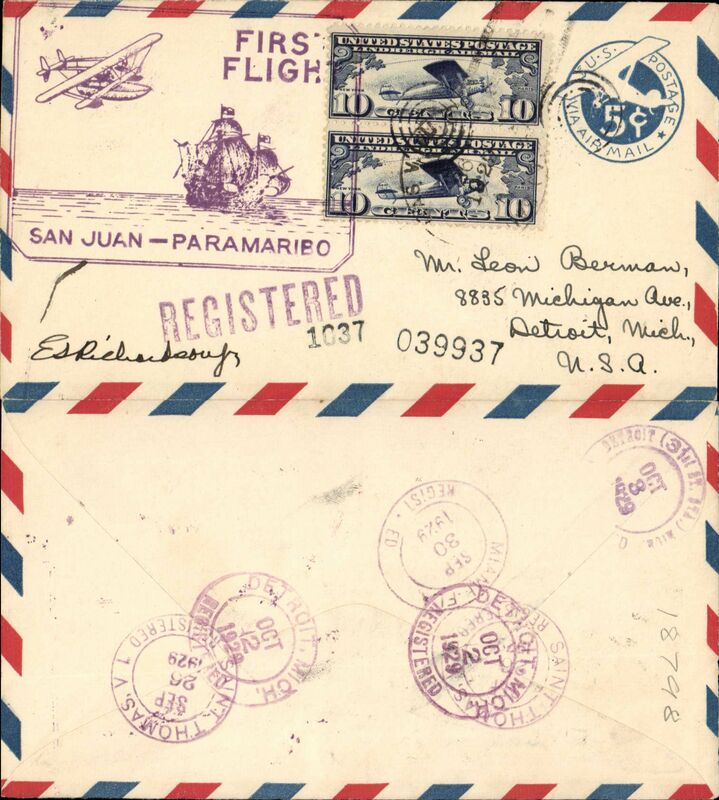 Pan Am F/F FAM 6, San Juan to San Pedro de Macoris, Dominican Republic, purple diamond flight cachet,bs, airmail cover. 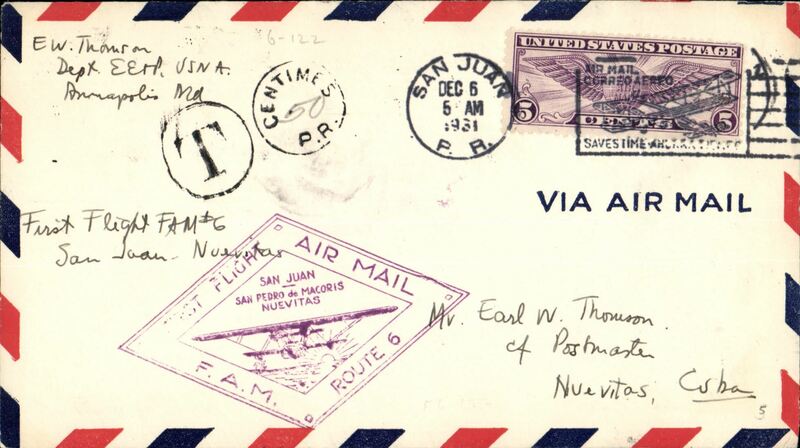 F/F FAM 6, San Juan-Nuevitas, Cuba, b/s, flown by Lindburgh, Pan Am. Carried by Sikorsky S-38A amphibian. 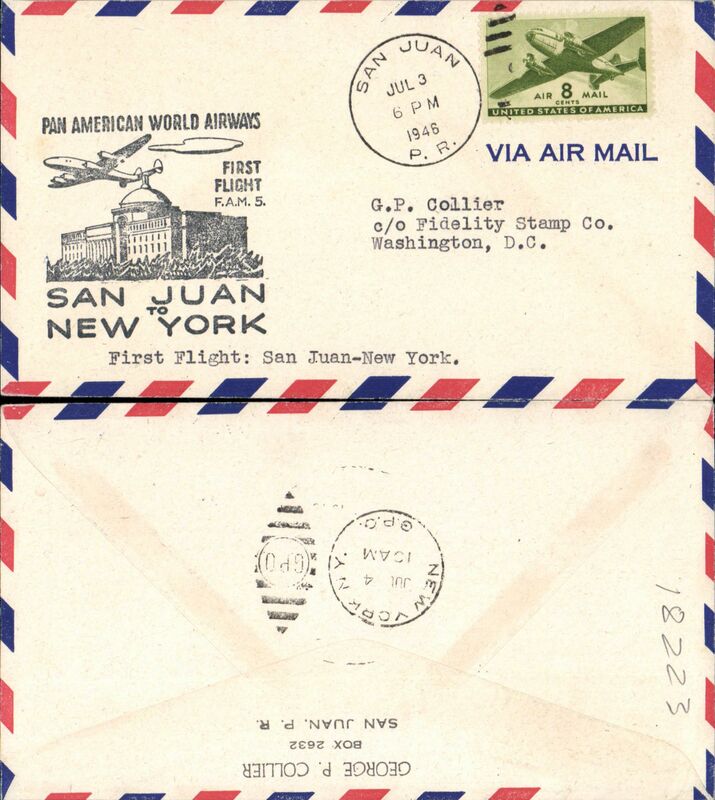 National Airlines, F/F San Juan-Ponce, airmail cover, flight cachet, b/s. Caribbean Atlantic Airlines, F/F Mayaguez-Ponce, cachet, b/s. 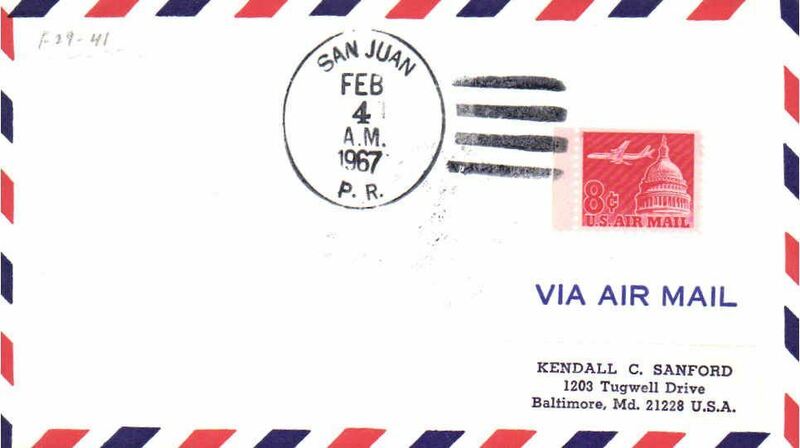 Caribbean Atlantic Airlines, F/F San Juan-Mayaguez, cachet, b/s. 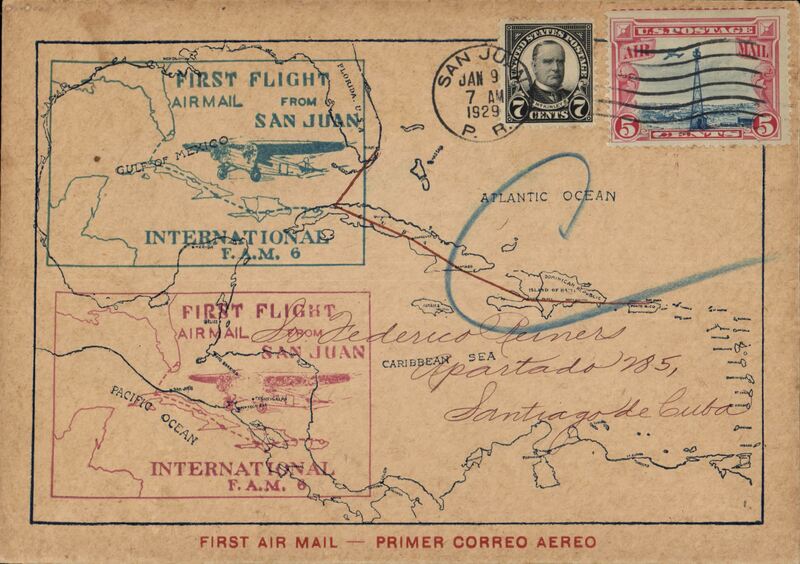 Caribbean Atlantic Airlines, F/F Ponce-Mayaguez, cachet, b/s. 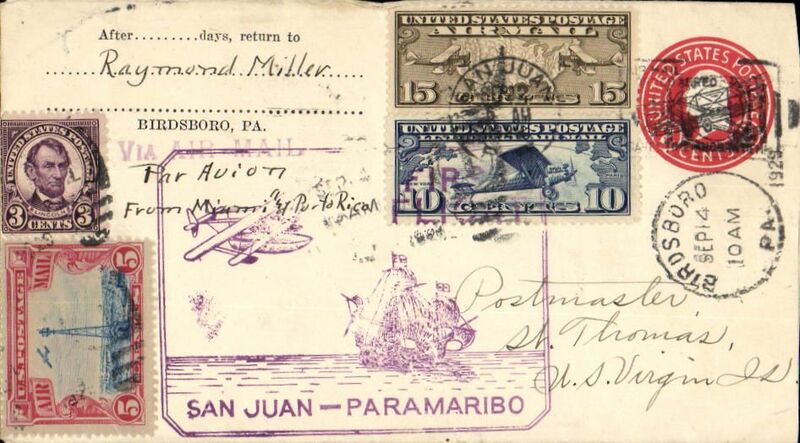 FAM 59 F/F San Juan-Cuidad Trujillo, Dominica, bs, cachet. F/F FAM 29, San Juan to Boston AMF, b/s, Eastern AL, only 30 flown. 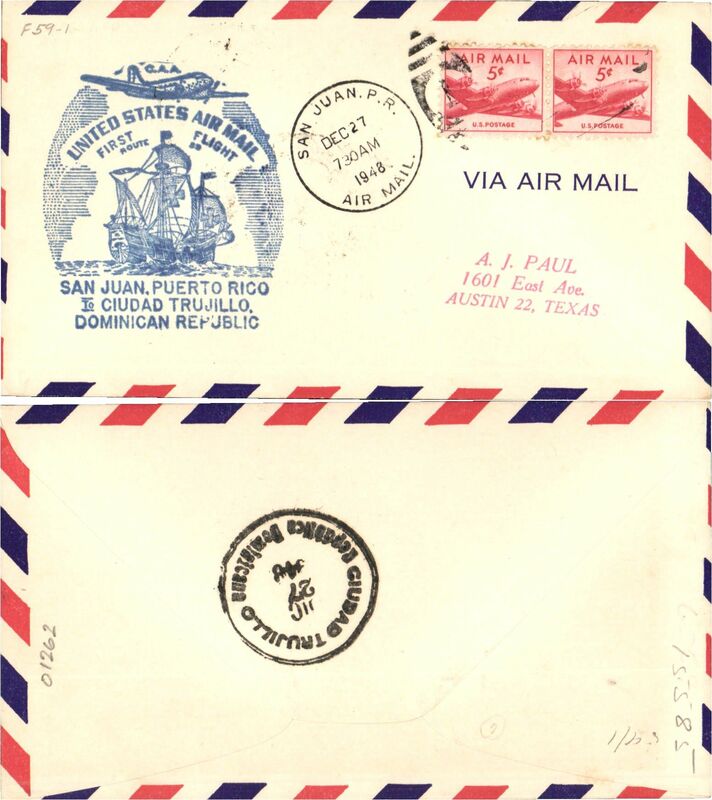 Eastern Airlines, F/F FAM 29, Boston to San Juan, b/s. There was no public announcement of this flight, hence no cachet and only 30 flown. 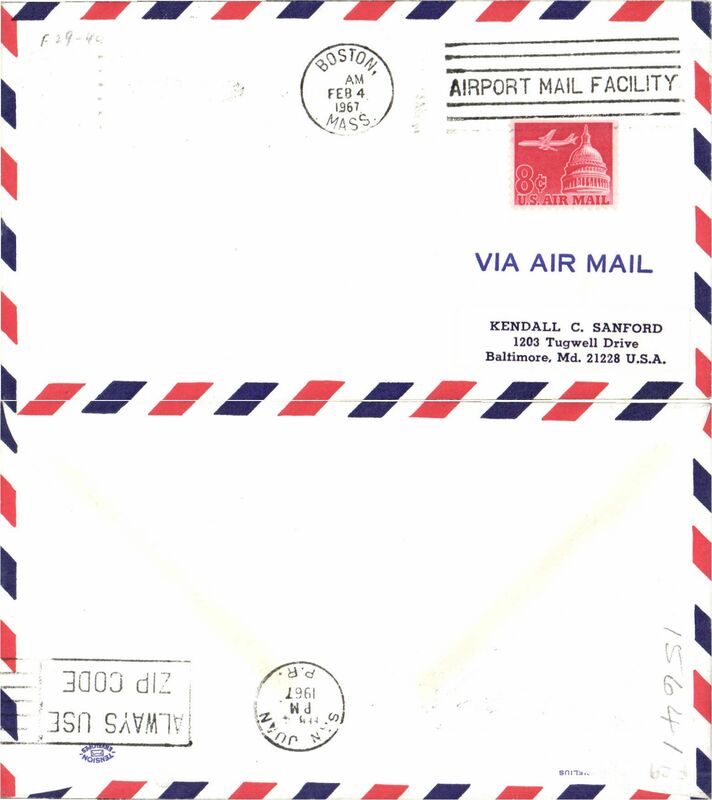 Valued $125 AAMC, 2004.